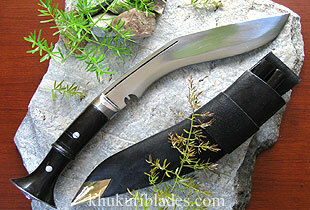 Yet another new Kukri by Khukuriblades.com. We call it the Little Champ. Why? This new Kukri is more like the Historic but in a eight inch blade with a thicker spine giving the blade the weight of a ten incher. So there is nothing that a ten incher can do and that this eight incher can not do. It is made with a full tang for better support. Buffalo horn handle is used as it is tougher than wood. Become a champ with this new Kurki.